We’ve Got Your Back announces their helpful recommendations for Los Gatos CPA Loreen Huddleston redesign her office for style and comfort. Los Gatos ergonomic seating and back store, We’ve Got Your Back helps Los Gatos CPA Loreen Huddleston redesign her office for style and comfort. Ms. Huddleston is a successful Bay Area CPA who typically works long hours at her desk and in front of a computer. She was experiencing back pain and neck pain and was growing increasingly concerned about the impact her work was having on her health and well-being. Her concern sparked a reinvention of her office, life and “workstyle” choices. Working with We’ve Got Your Back, Huddleston had an ergonomic evaluation that highlighted a number of areas for correction. Los Gatos tension relief store, We’ve Got Your Back installed a Workrite keyboard tray and advised her on accessories that would reduce her risk of injury from reaching, straining or excessive wrist flexion. Loreen didn’t stop there. With the help of a designer she completely remodeled her offices to improve lighting, color and comfort. A key purchase was the new OM5, an ergonomic office chair. The chair features a patent-pending body-activated motion that automatically adjusts to the user. “We’ve Got Your Back was able to support Huddleston by helping her understand her seating options and confidently recommend a product that would fit both her newly designed office as well as meet the requirements for a safe and comfortable seating solution,” says Rita Marcojohn of We’ve Got Your Back. Ms. Huddleston is one of a growing number of executives committed to adopting healthy work habits by investing in an office that provides sound ergonomics, comfort and style that makes a statement about their work and well-being. 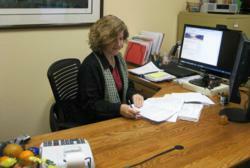 To discover more about Ms. Huddleston, visit http://www.huddlestoncpa.com. For more information on We’ve Got Your Back, call 408-395-1122 or visit http://www.back2active-bayarea.com. We’ve Got Your Back is located at 114 Royce St., Los Gatos, CA 95030. Loreen E. Huddleston, CPA, is an accounting professional located in downtown Los Gatos with more than 25 years of experience in accounting, income tax preparation and planning. The focus of Loreen’s practice is assisting individuals, small businesses and trusts not only to minimize income taxes through strategic planning, but to maximize long term financial well-being. Los Gatos ergonomic accessories store, We've Got Your Back is a business delivering best-in-class products and services in ergonomic seating and accessories, fitness gear and comfort solutions. Its goal is to help eliminate the root cause of pain. The showroom in Los Gatos was designed to serve the community with educational programs, fitness classes and product demonstrations. We’ve Got Your Back offers its products and solutions to support the home office, telecommuter or office workstation with training, chair fittings, ergonomic assessments and lifestyle support programs. The back store is capable of providing tension relief, zero gravity chairs, ergonomic seating, neck pillows, doctor recommended pillows, fitness training, ergonomic accessories and more.